The Red Bait Crab is distinctive because of its dark colour, and heavily notched front and rather hairy carapace and legs. See the spines poking forward from the carapace. The hand and carpus of the chelipeds have long rows of coarse tubercles. There are also spines between the eyes. The first segment of the walking legs is flattened, while the rear margin of each leg is armed with spines and teeth. 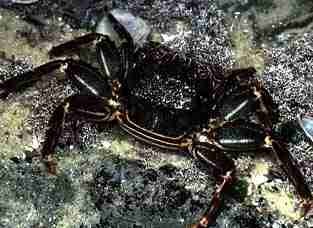 The claws are much larger in the male crabs. 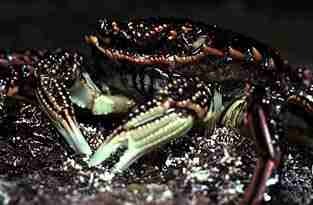 The Red Bait Crab's carapace colour is a deep red-brown, with pale regions on the walking legs and feeding chelae. The Red Bait Crab ranges from Newcastle in New South Wales, south through Victoria, Tasmania, and along the southern shores across South Australia to Rottnest Island in Western Australia. The Red Bait Crab is found at low tide levels and below on high energy rocky shores. It hides under rock ledges, in crevices, and amongst algae. The Red Bait Crab is a favourite bait of rock fishermen. Its range is widespread, and occurs not only on southern Australian shores, but in both South Africa and South America. Bennett, I. (1987) W.J. Dakin's classic study: Australian Seashores. p.224, Angus & Robertson, Sydney. Davey, K. (1998) A Photographic Guide to Seashore Life of Australia. p.58, New Holland, Sydney. Edgar, G.J. (1997) Australian Marine Life: the plants and animals of temperate waters. p.215, Reed Books, Kew. Jones, D. & Morgan, G. (1994) A Field Guide to Crustaceans of Australian Waters. Reed, Chatswood. Quinn, G.P., Wescott, G.C. & Synnot, R.N. (1992) Life on the Rocky Shores of South-Eastern Australia: an illustrated field guide. p.74, Victorian National Parks Association, Melbourne. Marine Research Group of Victoria (1984) Coastal Invertebrates of Victoria: an atlas of selected species. p.122, Museum of Victoria, Melbourne. Underwood, A.J. & Chapman, M.G. (1993) Seashores: a beachcomber's guide. New South Wales University Press, Sydney.